You’d expect to see something out-of-this-world at the 115th Explorers Club Annual Dinner. But not even the most space-savvy souls, hardened to things of beauty thanks to their breath-taking views of the Earth from above, have ever encountered anything so beautiful as Buzz Aldrin’s suit, surely? Well, now the world gets to share in its appreciation, as it’s been captured in a photograph taken at the dinner, held on March 16, in a room overlooking Times Square in New York City. Before you are all bedazzled into a stupor by the silver satin patterned two-piece – paired with alternative American flag socks, a pink shirt, and matching silver bow tie, as well as his medal – let me tell you a little about the other guys in the picture. The eight man are the some of the last living Apollo missions astronauts, the guys who broke new ground in space and went where no one had gone before. From left to right, the group includes Charles Duke (Apollo 16), Buzz Aldrin (Apollo 11), Walter Cunningham (Apollo 7), Al Worden (Apollo 15), Rusty Schweickart (Apollo 9), Harrison Schmitt (Apollo 17), Michael Collins (Apollo 11), and Fred Haise (Apollo 13). 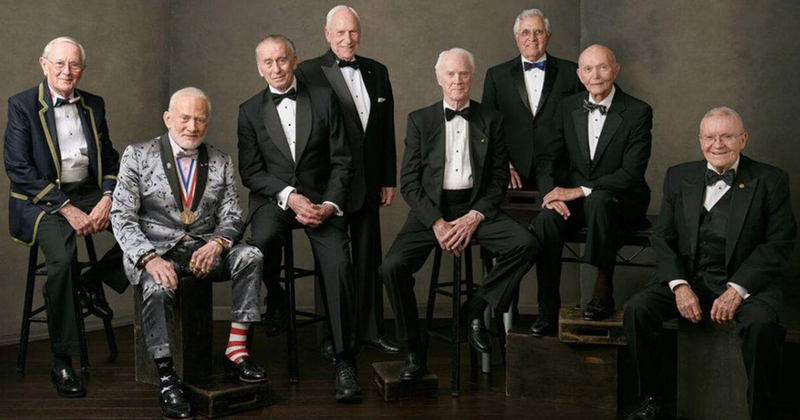 Other Apollo astronauts still living include Ken Mattingly (Apollo 16), Frank Borman (Apollo 8), Bill Anders (Apollo 8), Jim Lovell (Apollo 8 and 13), Tom Stafford (Apollo 10), Dave Scott (Apollo 9 and 15), and Jim McDivitt (Apollo 9) – shout out to those guys, too! The portrait some are now calling ‘iconic’ was taken by photographer, Felix Kunze, totally by accident. The import of this whole situation really only dawned on me after I had photographed eight of them and then realized that I had gotten every Apollo astronaut in attendance. I really didn’t think it was going to happen. Upon sharing the photograph on his Instagram account, he called it a ‘career highlight’. People often assume that when I photograph someone like this that there’s a lengthy process of getting them to be comfortable, but I don’t really approach it that way. These guys have been photographed over and over and over, and in this case, their individual poses were not as important as the sum of the parts that would make the final photograph. I often say that the best time to take a portrait is in the first two minutes or after a couple of hours. In the first two minutes, my subjects don’t really have a chance to even be uncomfortable. It was a particularly momentous occasion to capture on camera, he said on social media, as this year marks the 50th anniversary of the moon landing.